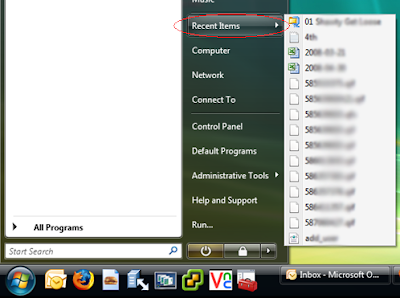 As in Windows XP, Vista has a small list that shows all files that were opened recently. By default, the value is set to 15. This number can be changed through a registry tweak. Start registry editor (Start> Run> regedit). Browse to HKEY_CURRENT_USER\Software\Microsoft\Windows\CurrentVersion\Policies\Explorer. 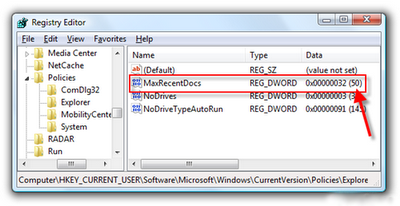 Here, right-click in the right pane and create a new 32-bit DWORD called MaxRecentDocs. Double-click on the entry and give it a Decimal type value of how many ever entries you want in the recently opened file list. Reboot when you’re done and the changes will be applied. If you do not want to have a list of recently opened files at all, the easier way is to right-click on the taskbar and click on Properties. 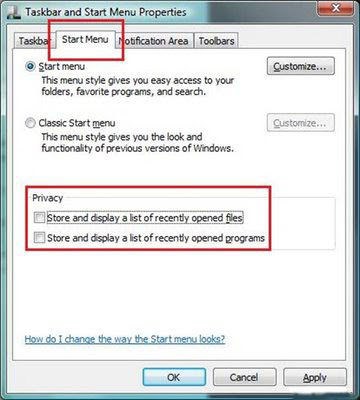 Click on the Start Menu tab and uncheck the “Store and display a list of recently opened files” box.